There are two very important reasons why Save Ontario Dogs came to be – and their names are Brittany and Rambo. About two years ago, I received an e-mail from my friend Kim Lindsey about two dogs that were seized in Brampton because the dogs were supposedly pit bulls. At the time, I was aware of the breed-discriminatory legislation (BDL) in Ontario but not of the devastating impact it was having on dogs and people alike. Up until this point, I was managing an animal rescue in Mexico with the focus being on positive community outreach and animal welfare. I was soon to find out how different things were being run in my own backyard in Canada. My assumptions were that BDL impacted a small percentage of dog owners, and it simply meant that one particular breed of dog was no longer allowed to be bred or live in Ontario. I did not agree with it but also didn’t know of the thousands of innocent pets being pulled from their homes against the owners’ will and put to death. Like most people, I had no knowledge of the civil liberties that were being trampled upon and tax dollars used to support this abuse of my fellow citizens and their dogs. 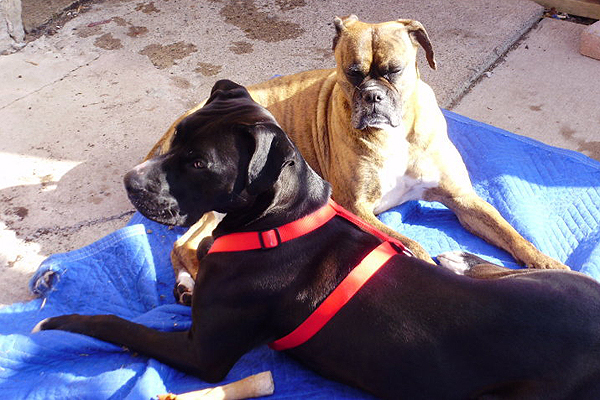 In this case, both dogs were seized from separate homes on Jan. 13, 2010. The city’s veterinarian declared they were pit bulls under the city’s bylaw, despite the fact that the families had produced documents identifying them as Boxer/American Bulldog crosses. The two dogs in question were sister and brother, Brittany and Rambo. 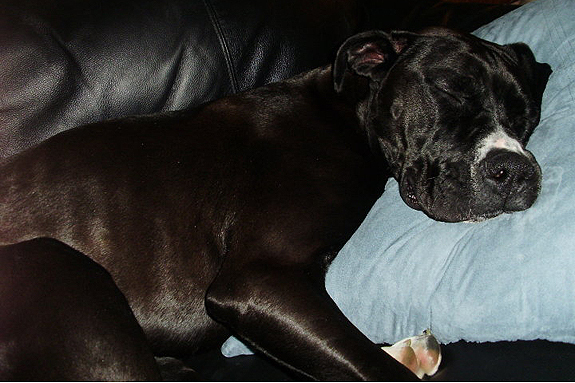 Rambo at the time was even licensed by the city as a Boxer/American Bulldog cross. So what led to the seizure? 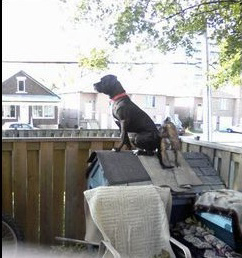 Much like Snoopy, Rambo likes to sit on top of his doghouse in the backyard. One day in December, passing animal control officers (ACOs) spotted Rambo minding his own business atop his doghouse in his backyard, home of 75-year-old Maria Gaspar. They went to the door and questioned the senior citizen about his breed. 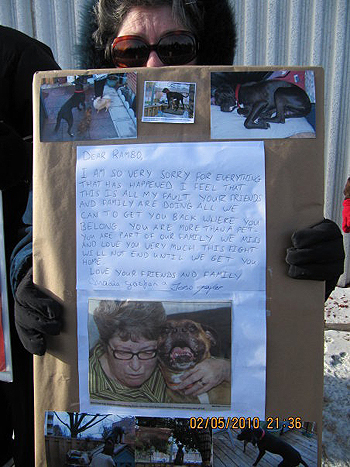 She explained that she received Rambo as a puppy from the Branco family, who lives just a few blocks away. She and her husband were given a warning stating the doghouse was too close to the outer fence. The ACOs said they felt Rambo would be able to jump the 20 feet required for him to clear both fences that surround the Gaspar’s property and escape, and therefore, they must move his doghouse. ACO officers then proceeded to the Brancos for a “routine” license check. The licenses for Brittany and Brittany’s mother, Jersey, had recently expired, but the Brancos immediately complied, and paperwork was filled out on-site. They gave payment directly to the ACOs. All the family was given in return was a receipt for payment. No paperwork was received by the Brancos stating the dog’s breed, but the family wasn’t concerned, as they had told the ACOs that the dogs were Boxer/American Bulldog crosses and would provide documentation later when their daughter arrived home, as she kept the dogs’ papers. The ACOs asked about Brittany’s father, Tyson (who is also Rambo’s father, as Brittany and Rambo are from the same litter). Tyson is no longer at the Branco home, as he was adopted to a farm in Northern Ontario months earlier. The Brancos have always been clear that Tyson is half Boxer, half American Bulldog. The mother, Jersey, is 100 percent Boxer, making Brittany and Rambo 75 percent Boxer, 25 percent Bulldog. The family had the paperwork/vaccination records stating this. The Brancos paid for the new licenses and thought it was over, but it wasn’t. Brampton Animal Control returned to the Branco home, but this time, it was not to be a routine license check. They demanded Brittany be surrendered since she was the offspring of a pit bull and was deemed illegal under the provincial and municipal Dog Owner Liability Act (DOLA). Apparently, when filling out the paperwork for Brittany’s license, the ACO wrote her down as a pit bull, regardless of the fact that the Brancos told them she was a Boxer/American Bulldog cross and had papers to that effect, which they would show them when their daughter arrived home. When they showed up to seize Brittany, the Branco’s adult, special-needs son, Joseph, was also home at the time. The Brancos protested, telling the ACOs to leave, with Joseph holding on to Brittany. The ACOs then called in the Peel Regional Police, who showed up with four police cruisers, no warrant (see our previous article on BDL in Ontario, which explains how no warrant is needed to seize pit bulls) and proceeded to force their way into the property, physically restrained Joseph and seized Brittany. They told them to go to the shelter, present the paperwork and then Brittany would then be released. From there, the ACOs went to the Gaspars to seize Rambo. They were told to hand over Rambo or police would be involved as they were at the Brancos. All this to seize two docile, family dogs from senior citizens and a special needs adult. Keep in mind, there were no complaints about the dogs – no accusations of aggressive behavior, running loose or biting – absolutely no incidents at all. All that happened was an ACO saw Rambo sitting on top of his doghouse sunning himself on his owner’s property and on that day, her actions tore two families apart. The families were told all they had to do is show up at the municipal shelter with the paperwork stating the dogs’ breed, and they would release the dogs. The Brancos and the Gaspars immediately went to the shelter and presented the information, but they were refused and told that the “city vet” had examined the dogs and determined they were, in fact, pit bulls. Brittany and Rambo were scheduled to be euthanized in five days. It was later found out that the city vet had “examined” them from a photograph. Up until this point, I didn’t know the full details nor did I know the families, but I took a chance and contacted the Brancos to find out firsthand exactly what was going on and how I could help save Brittany and Rambo. They agreed to meet with me. Both families were wonderful, loving, law-abiding, hard working people who have been kind and responsible dog owners for many generations. They loved their dogs and were devastated, shocked and suffering more and more as each minute went by. After meeting them, the injustice was even more heartbreaking and intolerable. The Branco’s other son, Rui, had already contacted his lawyers so that the families would have legal representation. This was good but we needed to rally resources to give the family support and to put a spotlight on this incident and media pressure on the city. This is where I felt I could help. I knew if I was angered by this incident, a lot of other people would be too. I immediately started a Facebook page, online petition, organized rallies and learned the ins and outs of DOLA. Drawing from my past media experience, I put together press releases to the local media outlets on a regular basis so that the media was inundated with Brittany and Rambo stories. Before we knew it, we had over 10,000 Facebook supporters, and the story was appearing in major news sources. So what was the city doing in the meantime? They were not allowing the family to see the dogs. Only after communications from the Branco lawyers was the youngest daughter, Ines, allowed to see Brittany, but no one could see Rambo. There were rumors Rambo was becoming aggressive under the care of the Brampton Animal Contol shelter. Rambo had never shown a sign of aggression and was always a docile, loving family dog. We didn’t know how Brittany and Rambo were being treated and for their sakes, we needed to get them of there and fast. The city also hired a Toronto corporate law firm, which was unusual, as the city has lawyers on staff. The city later footed that legal bill to the Brampton taxpayers, along with all of the other bills associated with the case. Instead of doing right by the families and the dogs, the city dug their heels in. The dogs remained in custody throughout the ordeal. The way it was going, it looked as though it was going to have be decided in the courts, so we put the media and public pressure on heavily, bringing attention to the case every step of the way. A private investigator heard about the case and offered to assist the Branco family’s legal team in their research. He investigated the “city vet” who practiced not in Brampton but in Maple, Ontario. When the investigator arrived at the vet’s office, he was informed that the vet was on a six-week extended vacation in India and could not be reached. He showed the vet’s associate, a fellow DVM, photos of Brittany and Rambo and asked if he thought they were pit bulls. He said, “No.” The investigator also showed him his associate’s signature (the “city vet”) on the document that stated that Brittany and Rambo were pit bulls. He did not recognize his associate’s signature. The private investigator then showed the signature to the office administration staff, and they couldn’t identify it either. No one recognized it as being the vet in question’s signature, yet it was this signature that was responsible for identifying Brittany and Rambo as pit bulls, thus ordering them to death. – Choose a non-biased veterinarian who has not been involved with the dogs in any way to judge if the dogs are pit bulls. If the vet finds they are not pit bulls, the city will release them on the condition they are deemed dangerous under the Dog Owners Liability Act (DOLA). This means the dogs will be leashed and muzzled when in public, wear special tags, and the families will be required to display a sign on their home stating a potentially dangerous dog resides at the residence. Also, the families could not take legal action against the city. – If the vet’s findings are inconclusive, then same outcome. – If the vet finds in the city’s favor, then a destruction order will be carried out. The family had a difficult decision to make. They could go to court, which would leave the dogs in the city’s custody for potentially a year, or put Brittany and Rambo’s lives in the hands of an independent vet and have them unnecessarily deemed dangerous dogs. They just wanted their dogs home safe and sound, so they took the city’s deal. An independent veterinarian was brought in and within 15 minutes, the vet’s exam of both dogs was finished and the finding was clear: Brittany and Rambo are not pit bulls. The dogs were released back to their families that day. 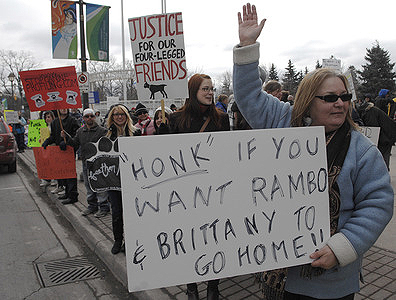 The entire process from the time Brittany and Rambo were taken from their homes to the day they were returned took almost five months, with Brittany and Rambo being in the city’s custody the entire time. When Rambo arrived home, he had a broken rib. 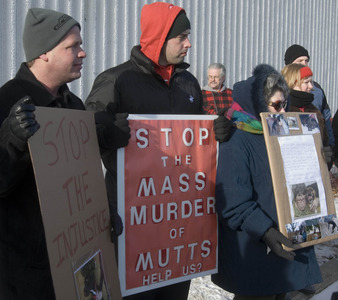 There are countless more details about this case; every instance of the city or animal control trying to order the dogs’ destruction or keep them from their families that was put in front of me was more upsetting than the next. Things kept coming out of the woodwork, and the details are far too many too mention. But this is the story, in short. 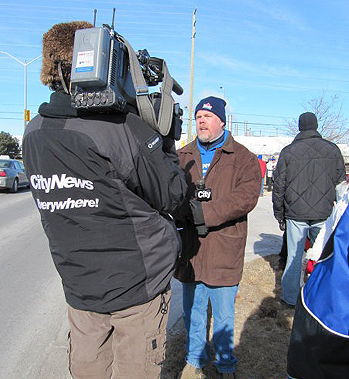 The cost to the taxpayers of Brampton: thousands of dollars. The cost to the Brancos and the Gaspars: heartbreak, tears and sleepless nights wondering what was happening to their dogs. In the end, the Branco’s son, Rui, paid $25,000 in lawyer’s fees. We worked tirelessly to get media attention and rally citizens behind these two beautiful dogs and their families. But unfortunately, most people cannot pay for lawyers and don’t know how to fight back or organize publicity. They feel intimidated and bullied so ultimately, their dogs die. That’s what became so clear to me in all of this, which is why Save Ontario Dogs was formed. I wanted people to have a place to go to get help and answers in situations like this, or to know what to do if someone questions their dog’s breed or tries to seize them. Since then, Save Ontario Dogs has had other cases where dogs have been wrongfully seized as “pit bulls” or in some cases, they have been pit bulls but have been wrongfully seized or charged for no incident whatsoever. I’m happy to say, we have, to date, been victorious in the cases we’ve been involved in, but I use the word “victorious” with a heavy heart. The victory is that the dogs have not been euthanized, but every situation is one that never should have happened. The most recent case, which just wrapped up on Dec. 11, is an American Bulldog named Gabe who was given an order of destruction and charged for being a pit bull when all he did was run from his yard and was, in fact, attacked by another dog. But because the ACO thought he was a pit bull, he was charged and the other dog, who was a Rottweiler, was not. After three court dates (where I attended and acted as the family’s advisor, as they could not afford an attorney) and bringing in one of the top Canadian Kennel Club judges in the country, the dog was declared “not a pit bull” and allowed to live. This was a six-month long process and luckily, in this case, the dog was not seized and allowed to remain at home during the trial. But it was tough and the prosecution ran it like a murder trial, all because of an ACO thought an American Bulldog – who had absolutely no incidents – looked like a pit bull. And it came out in court that the ACO’s training consisted of a 45 minute – six hour online course in breed identification. These are the people who hold our dogs’ lives in their hands. There are other cases going on all the time in Ontario, where organizations like Save Ontario Dogs are trying to help people whose families are being torn apart by this law. There are also those families who don’t know where to go for help and end up falling through the cracks. There is one bit of hope on the horizon. Currently, there is a bill before the provincial house called Bill 16, which will remove the BDL clauses from the DOLA. This means that dog owners will have to be responsible, as always, but the BDL portion (which we outlined in our last article) that speaks specifically to pit bulls and dogs who “resemble” pit bulls will be removed. It has made it through the first reading and has two more readings in order to be accepted. The second reading takes place in February. This will hopefully put an end to the witch hunt and terror that has been going on in Ontario since BDL was enacted in 2005. So as we hope with all of our hearts that Bill 16 passes, I am happy to say Brittany (above) and Rambo have recovered from their trauma and are now living their lives joyfully with their families, hopefully forgetting the horror of being pulled from their homes and put in the city shelter for months on end. I remain friends with the families and close friends with Rui and Ines Branco, who are steadfast advocates for change and stood strong at every rally for Brittany and Rambo. Those two dogs changed my life forever. For more information on Save Ontario Dogs, visit www.saveontariodogs.com. 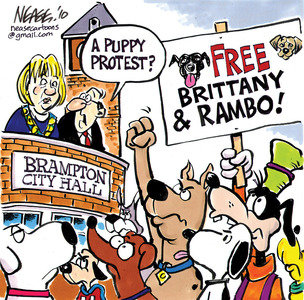 To view the newspaper articles that followed the Brittany and Rambo case, go to www.bramptonguardian.com and enter “Brittany and Rambo” in the search box. Reading this has my blood boiling. Thank you for getting involved and not turning a blind eye to the atrocities facing these dogs. This makes me sick to my stomach, such ignorant folk. I am currently going through asimilar incident with the City of Brampton where they have forced me out of my own home .. by using a abusing noise bylaw to stop work (24 hr noise bylaw)were are untrained and non qualified personal have made outrageous accusations . What sickens me is the fact that rambo had a broken rib when he came home. These people need to be held accountable for this complete and utter bs. The hugely misinformed ACO caused these poor dogs to be subjected to harma nd require medical treatment, I’d be going after that ACO for damages. He’ll think twice about his assuptions in thefuture. Even though I am very familiar with this story, signed the petition, etc., I still have tears in my eyes when I think what these dogs and the family endured. Thank you for setting out the facts so succintly. I will direct all my friends, dog owners and non-dog owners, to this page so they can see what breed legislation/discrimination is like in real life. To think my husband and I are worried about leaving our dogs with a house sitter for a vacation because they will miss us and normally accompany us on all vacations. For something like this to happen is a horror story and then some. I would be an absolute basket case. And I agree with Will, how in the world does the ACO not have to answer for the broken rib?